Shrink sleeves are the seals use to seal the caps of the bottles or jars to there necks to avoid the possibility of adulteration by opening the caps of bottles or jars. 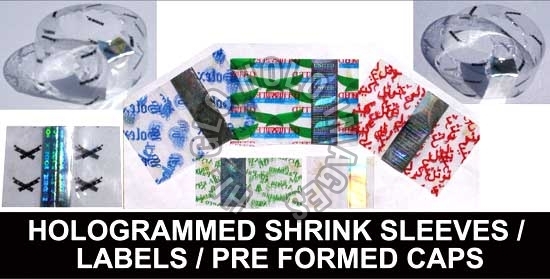 In holo shrink sleeves a hologram strip is laminated from inside on the sleeves to ensure that the holograms aredamaged when the seal is broken & it makes the packed material absolutely pilfer proof and secure from counterfeiting. These can be supplied as cut pieces or as preformed caps for manual application and as pipes for automatic appplicators. Holo shrink labels are similarly multi colour printed shrink labels for cartons/ bottles/ jars etc with Hologram strips applied from the inside.